“What’s for breakfast” has been a difficult question in this house. I know that breakfast is important and it kicks our day off right, but TIME, people, TIME! Hitting that snooze button that one two three extra times really throws off my schedule. At times like those, I need a breakfast that is quick to prepare, healthy to eat, and delicious for everyone. Just launched in April, it is the perfect choice for anyone who has trouble finding time for breakfast in the morning. In less time than it takes to make a cup of coffee, heat the six-ounce microwaveable cup – no milk or water necessary – in the microwave for 45 seconds. Seneca’s Oatmeal & Fruit has no trans fats or cholesterol, and is a great source of Vitamin C.
You know what I really like? Apple pie filling. 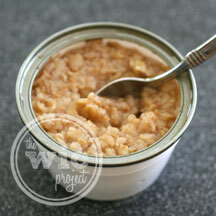 Why am I starting a post about Seneca Farms Oatmeal & Fruit by talking about apple pie filling? Because THAT is what the Apple Cinnamon Seneca Farms Oatmeal & Fruit tasted like to me. But without the guilt that comes with eating pie for breakfast. Preparing the Seneca Farms Oatmeal & Fruit couldn’t be easier. Simply peel back the edge of the plastic top (for venting) then nuke in the microwave for about 45 seconds. When then timer goes off, you have a bowl of delicious oatmeal that has tons of flavor and is very filling without being heavy. The oatmeal comes out the perfect temperature and the apples still had a bit of crunch to them. Make sure you stir everything up well since I found that a lot of the fruit had settled on the bottom. As I mentioned earlier, I thought the Apple Cinnamon was awesome. If you’re a peach lover, then you’ll definitely like the Vanilla Peach flavor – with it’s subtle vanilla flavor and burst of peachiness. You don’t need to limit Seneca Farms Oatmeal & Fruit to just breakfast, though. It is also a great option for snacking since it has no trans fats or cholesterol. Can’t you just picture a enjoying a warm cup of oatmeal & fruit during a nice, quiet afternoon? 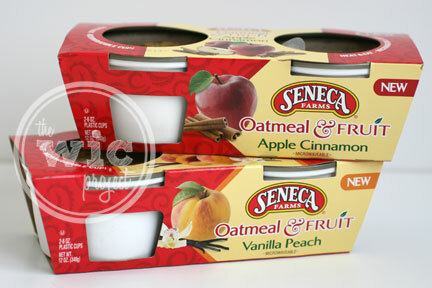 Currently Seneca Farms only has two flavors of Oatmeal & Fruit – Apple Cinnamon and Vanilla Peach. There are plans to introduce Cranberry Apple and Maple & Brown Sugar later this year and I can’t wait to try those flavors as well. If you would like to try out Seneca Farms Oatmeal & Fruit, you can find them at Walmarts nationwide and at a variety of grocery stores. One winner will receive a 2-pack of each flavor (Apple Cinnamon and Vanilla Peach) of Seneca Farms Oatmeal & Fruit. Leave a comment sharing which flavor of Seneca Farms Oatmeal & Fruit you’d like to try the most. +1 “Like” Seneca Farms on Facebook. +1 if you follow Seneca Farms on Twitter. Giveaway ends at 11:59 PM EST, August 18, 2011. I’d love to try the Apple Cinnamon flavor. I “Like” Seneca Farms on Facebook. I follow Seneca Farms on Twitter. I want to try the Vanilla Peach! id like apple cinnamon please. I would love to try the Vanilla Peach since I love peaches! I’d like to try the apple cinnamon! I already like you on FB (Anne Gal***k) … I’d also like Seneca, but FB seems unable to do that this morning! I would love to try the apple cinnamon. vanilla peach sounds really yummy! I’ve always liked apple cinnamon so I would love to try that one. i would love to try the vanilla peach kind….sounds yummy! I want to try the vanilla peach flavor. following seneca on twitter as leslieluvsalan. would love to try the apple cinnamon. I’d love to try vanilla peach. Thanks for the giveaway! I’d love to try the apple cinnamon flavor. I love oatmeal and apples…it’s a great combo. Vanilla peach sounds very yummy! I would try the Vanilla Peach. Sounds delicious. I love oatmeal! And I would really like to try the apple cinnamon. I would love to try apple cinnamon. “Like” Seneca Farms on Facebook. I’d like to try the Vanilla Peach, but when the new flavors come out, Maple & Brown Sugar is the one that I want. I’d love to try the apple cinnamon. I’d love to try the Apple Cinnamon flavor 🙂 my favorite oatmeal flavor period! Liked Seneca Farms on Facebook! Liked the WIC Project on Facebook! Followed Seneca Farms on Twitter! I would love to try apple cinnamon! I would like vanilla peach. I’d like the Apple Cinnamon flavor. The Vanilla Peach sounds delicious! Vanilla Peach would be my flavor of choice! I would like to try Vanilla Peach. I would like to try vanilla peach! Mmmm! Vanilla Peach would be awesome to try! Vanilla Peach would be awesome ! “Liked” Seneca Farms on Facebook. Subscribed to The WiC Project via email and confirmed. 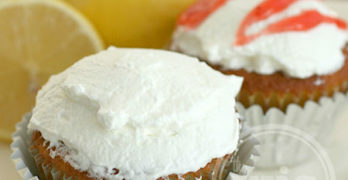 I would like to try the vanilla peach kind, looks yummy!